Just got to Boston. - I bet you think this blog is about you. And am wasting record amounts of time. 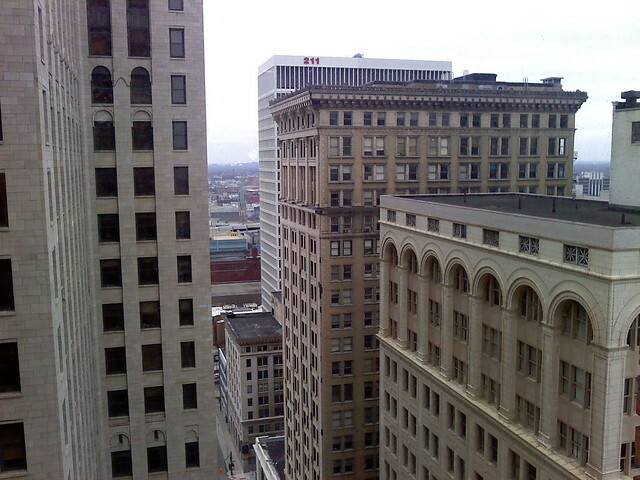 View from the Guardian Building, Detroit. Because ... I don't have any Boston photos yet. Apparently everyone's been in a hurry to deliver me to Boston. Our flight landed 30 minutes early; the flight attendants didn't even have time to finish slinging sodas to the whole cabin. I got mine, though. Row 11 FTW. Then my cab driver was not into speed limits, so I was in my hotel room by 4:15 despite an estimate that I'd get here around 5:00. I headed to get my conference registration stuff from the convention center, ran into Bre and Amy, then got my bag o'junk and chatted with them and Amy's friend Ben from Ohio State. We may all go to dinner later. Then I went off to Walgreen's, bought necessary toiletries and food, came back and did student loan exit counseling. Wahoo. I should probably be unpacking or figuring out which sessions I'm going to, but I can't be bothered.